“I’ll teach you how to jump on the wind’s back- and if there are more winds than one they toss you about in the sky- they fling you miles and miles- but you always fall soft into another wind- and sometimes you go crashing through the tops of trees, and scaring the owls, and if you meet a boy’s kite in the air you shove your foot through it. It was a play clearly meant for children, for it is they who believe…that anything and everything is possible, they who believe that “dreams do come true, if only we wish hard enough”. Growing up is the reality of life, where one loses faith and trust in magic and guardian fairies, where we are so armed with certainty, and yet feel only lost in life’s infinite maze? We are caught in a prison within our own minds, believing we have lost the ability to believe. And that I believe was really the message J.M. Barrie was trying to leave beneath all the fantasies and magic in the air. 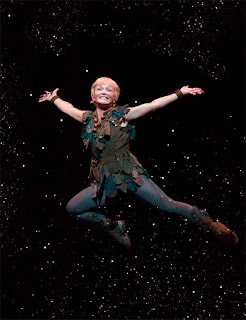 Peter Pan is a well known story, however the story has seldom been told as per Barrie’s most original script where the idea of an obstinately young boy and Neverland was born. More than 50 prose versions and several film versions have all brought different meanings to Peter Pan, and the concept behind the boy who never grew up. However, this play I watched was straight from Barrie’s diary and his original notes and dialogues. This play had a narrator who walks amidst frozen scenes and talks about the bigger picture behind the action and the complexities of thoughts lurking inside the characters. The idea behind the narrator evolved from the necessity to include Barrie’s notes in the margins of his work. The sets and costumes were outstanding…simple, elegant and outrageous. Every actor right from the most insignificant pirate to the silliest “lost boy”, every “animal” from Nana the dog(nanny) to Starky, the crocodile were perfectly adorable. I could find no complaints there. I loved the part when there was a kid flying 5 feet over my head and the clouds were all around me. (This was due to the fact that I had scooted into an empty gold circle seat once the play had started)The most praise-worthy aspect of the play however was the script. The dialogues were heartfelt, cute, thought provoking, and above all very witty. I have always been a fan of harmless sarcastic humor, and this play had plenty of it. Some wit I only understood a few seconds too late, but appreciated them more for that very reason. I wished I could have recorded the dialogues alone just to hear some of them again. Well, but I do not think I would do so, even if I could. My one complaint against this play was that it was too long. Neverland even with all its pirates, mermaids, lost boys, and Starky was getting a bit too much to humor as we were getting close to the two and a half hour mark. But, it might also be due to the fact that I had lost the ability to believe. I was one of the few who un-sportingly did not clap when Peter cries to the “people out there” to clap if they believed in fairies, for only then would the life of tinker, his fairy be revived. It mattered not…the spirit was felt. I have seldom liked a review as much as I liked it... since i found its concept very close to my heart. I wish I could believe in the line “dreams do come true, if only we wish hard enough” as much as i did in my yesterdays.